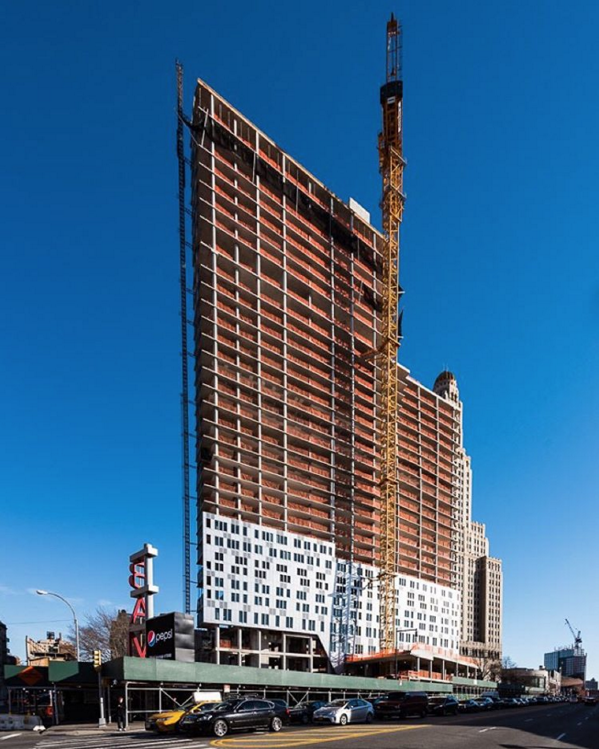 TEN Arquitectos‘ 286 Ashland Place, a 384-unit, 32-story mixed-use development in Downtown Brooklyn, has topped out. The building’s 45,148 square feet of community space will host 651 ARTS, The Museum of Contemporary African Diasporan Arts, the Brooklyn Academy of Music (BAM), and the Brooklyn Public Library. The New York– and Mexico City–based firm has a number of major projects in design and under construction. Their campus for Centro, a technology, design, and business university in their home city, opened in September 2015, while plans for the Mexican Museum and residential building at 706 Mission Street in San Francisco are moving forward. Last month, TEN Arquitectos revealed renderings of a luxury resort in the Cayman Islands. 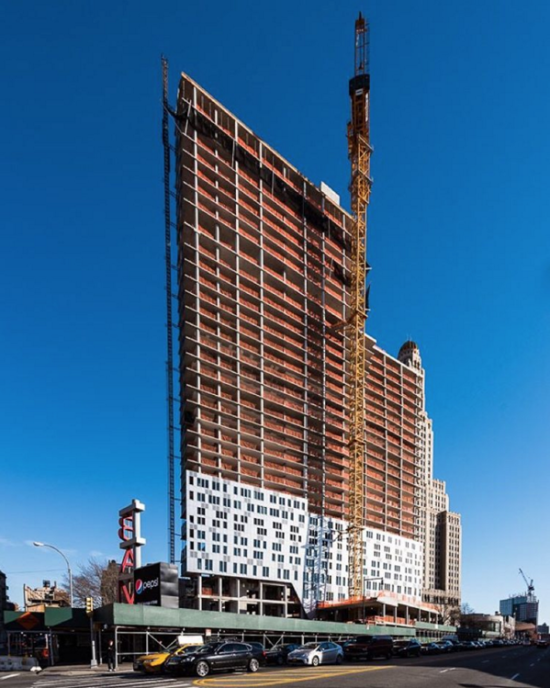 At 286 Ashland Place, 20 percent of the units in the building are set aside for affordable housing. The building will host 21,928 square feet of retail. 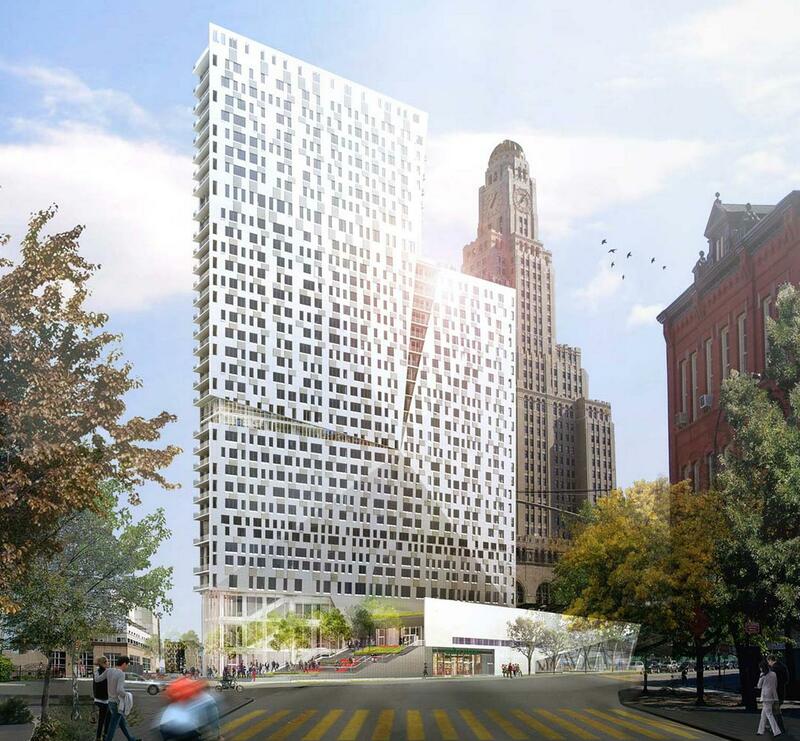 Construction is expected to be complete this summer, YIMBY reports. The project is located within the Brooklyn Cultural District, a Fort Greene development plan anchored by BAM. The triangular lot, across the street from BAM and a block from Atlantic Terminal, fronts high-traffic areas on all sides. On the Flatbush Avenue side, ground-floor retail and a stepped plaza break up what could have been a monotonous street wall. The facade is reminiscent of the firm’s Mercedes House, in Midtown West. There too, the facade is broken up by a nonstandard arrangement of windows and built-in air treatment units. 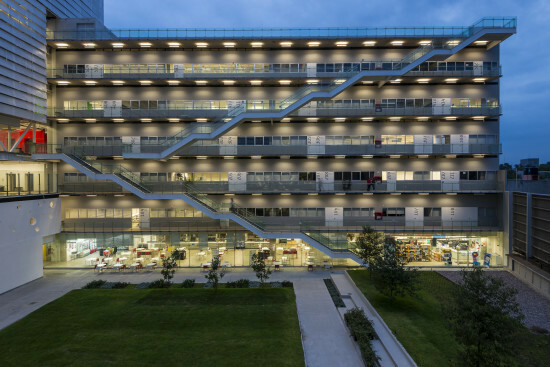 Mercedes House’s outstanding features are terraced cubes and snaking profile respond to the site’s steep elevation. 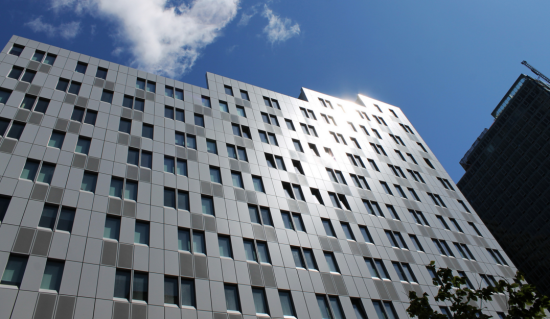 286 Ashland Place has a more standard site, and relies on an origami-ed facade for visual interest from afar. Though it obscures a previously unobstructed view of the Williamsburgh Savings Bank building the articulations of the facade draw the eye outward, towards the surrounding streetscape.